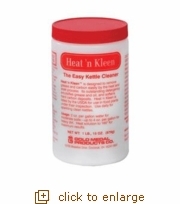 Product Info: Heat 'n Kleen™ is "the easy kettle cleaner"! Specially designed to remove grease and carbon with ease using a heat and soak process. Detergency emulsifies grease and oil and softens hard carbon deposits. Heat 'n Kleen™ is listed by the USDA for use in food plants under their inspection. Use daily or as needed for sparkling, clean kettles. Usage: 2 oz. per gallon of water for moderate soil. Use up to 4 oz. per gallon for heavy dirt. Use only on inside of popcorn kettle and heat solution to 160°F for maximum results. Net Wt: 1 lb. 15 oz.